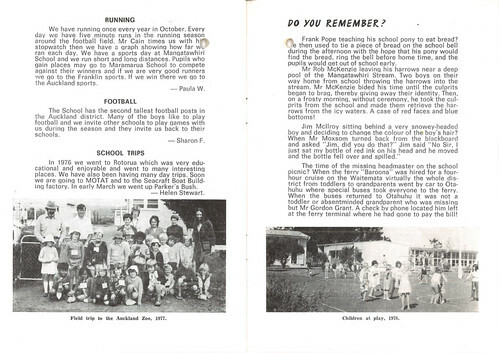 On 15 April 1978 Mangatawhiri School, south of Auckland, celebrated its centennial. In 1878 the school was first opened, using a local homestead to tutor 12 pupils. Then the increase in local population led to a purpose-built school on an acre of land, which included a horse paddock and playground. Mangatawhiri is a farming district east of Pokeno. At first a sole teacher school, this changed in 1916 with the employment of an assistant teacher. In 1925 the school was hauled by traction engine to its present site. A new building replaced it in 1962.